Sometimes I think I love Halloween as much as my students!!! Having grown up in Germany, we did not have this holiday (although it's been gaining popularity in the last few years), so I was always intrigued as a child, wishing I could get dress up in a scary costume and get free candy, too. I guess I am making up for this lost childhood dream by doing cool activities with my kids at school! I have all sorts of fun activities planned and will be posting about our speech sessions for the next few weeks. 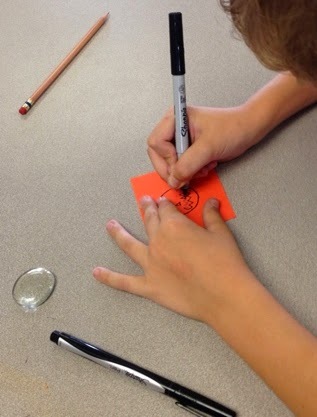 This week, I made Jack O'Lantern magnets with a bunch of my groups. This project was relatively inexpensive (less than $20 for almost my entire caseload) and the kids loved it. The magnets are surprisingly easy to make, although 1st graders and below may need a little assistance (hot glue is involved!). Some of our finished magnets. 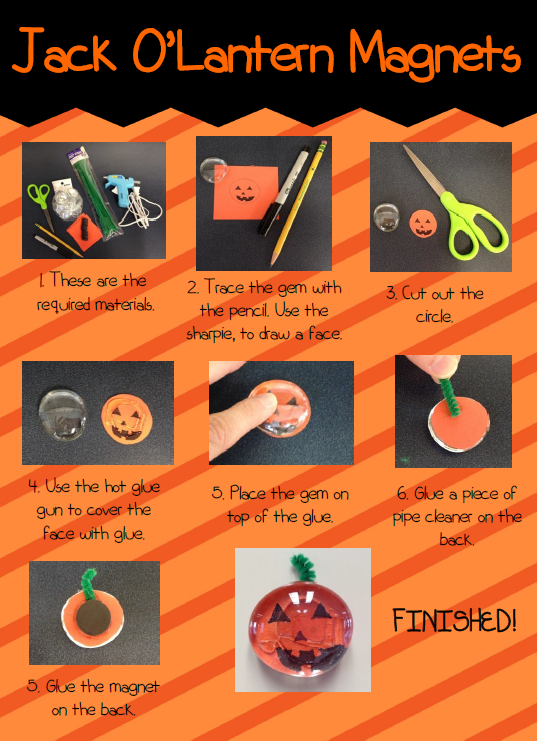 To make this endeavor therapeutic, I paired this activity by reading a pumpkin-themed story prior to making the magnets. I read "Pumpkin Jack" by Will Hubbell with my older students and "Big Pumpkin" by Erica Silverman with my younger groups. My language groups worked on answering comprehension questions, and my articulation groups worked on saying words from the book that contained their sounds. The magnets didn't take very too long to make (10-15 minutes depending on the group), so this worked out well. See the instructions on the left to find out how it's done. A 5th grader hard at work. To make this easier, I pre-cut 3"x3" construction paper squares prior to this activity. The kids had tons of fun designing scary or silly faces, and although many of them were a little wary about the hot glue gun, they were willing to give it a try with my assistance (I held down the pumpkin face while they squirted out the glue). I got lots of exclamations along the lines of, "This is so much fun!" and "Did you say I can take it home?!" One 4th grader was even astute enough to ask me whether I had gotten this idea off of Pinterest. Why yes, I did! The original pin can be found here.